Crazy mountain passes, drivers with no concept of staying in their own lane, landslides, flat tyres, police checks and car rental offices based in the boot of a car…oh what an adventure driving through Morocco can be! Choosing a hire car company can be a nightmare, especially with the number of online options available. In typical ‘on a budget’ style Andy opted for the cheapest option he could find online through Holiday Autos. Previously this had been a successful decision when we hired a car in Spain, despite some lack of information made clear in the terms and conditions regarding additional fees for fuel. The lesson learned was to always read the small print. And so, armed with the ability to regurgitate the whole list of t’s and c’s Holiday Autos had sent us, we began our search through Marrakesh airport for Location Auto (the company our booking had been passed onto), to no avail. Eventually we managed to track them down in the car park to their ‘office’, which was literally the boot of a car! The guys there were friendly enough, but the small print details didn’t seem to match up and it looked like any serious damage to the vehicle would leave us having to pay a huge percentage of the cost of the car. I am sure they were sound enough, and it’s not that we are high maintenance by any means when it comes to things like that, it just dawned on us that the risk would probably not be worth it. Had we understood the guys we probably would have been a lot clearer on the insurance cover, but our lack of French (totally our failing) meant that we were left pretty clueless as to the possible financial repercussions if we were to be involved in an accident. We decided therefore, to head back into the airport and try a company we had at least heard of before. Dollar were able to offer us a pretty good deal for a great sized Dacia Duster (what an apt name for our roady through the desert!) much better suited to carry us, our camping gear and two surfboards than the originally booked model. One of the locals in the car park had seen our change of decision and reassured us about our choice by saying “No office; no rules!”. We felt clear we had made a wise decision. Thankfully we took some photos of the car before we drove off, as when we returned the dusty Duster it did seem that they were going out of their way to try and find some fault which we could be held accountable for. Poor ‘Darcy’ had been scratched more times than an eczema sufferer before we took her out of the airport; there was no way we were to blame for her condition. 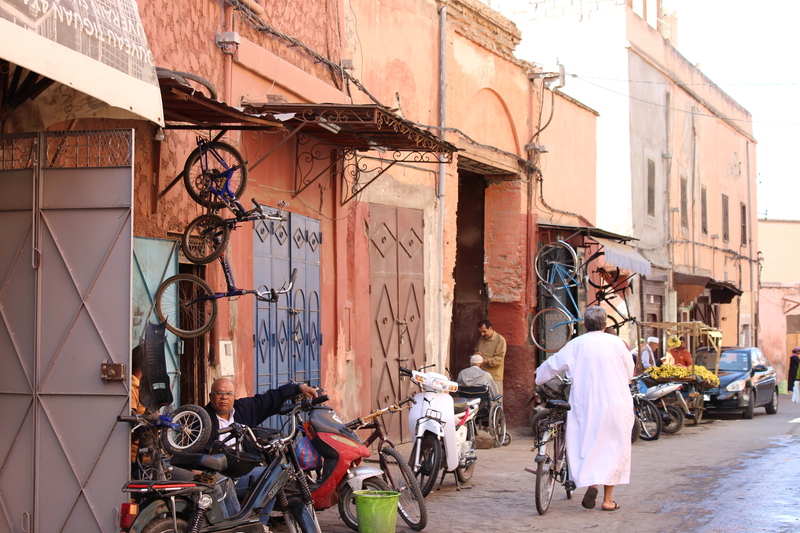 We were handed a map of the country and given some directions for how to navigate our way through the city to enter the highway towards Agadir and off we went…dodging motorbikes, lane hogging trucks and even camels through the labyrinth of streets that make up Marrakesh. Eventually the crowds thinned, the noise faded and like the opening of a children’s pop-up book; the mountains and desert scenery fanned out in front of us.